Our aim is to preserve and display the rich history of the Butterfield Overland Despatch stage line, as well as the	human and natural history of this corner of the Great Plains. In addition to items related to the Butterfield Trail, the museum's collection includes clothing, tools, and furniture used by early plains settlers. We also have an extensive list of books, periodicals, and photographs dating to the mid nineteenth century, as well as hard-to-find books on the Butterfield Trail and the area which are available for sale. Our fossil collection includes specimens from the Cretaceous Period which have been found in the area. Logan County is well known in this regard. 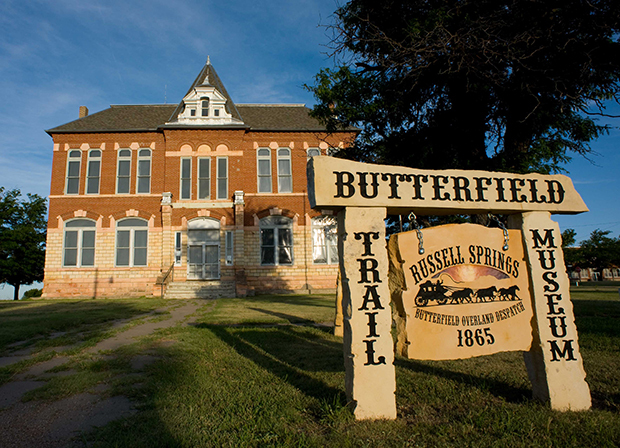 The museum is located in Russell Springs, Kansas and was previously the Logan County courthouse. It is funded through donations, grants, and fund raising events such as the annual Butterfield Trail Ride, held each year on the first weekend in June.